On 13 February 2019 I presented this research about Franz Marc’s woodcuts Schöpfungsgeschicte II (1914) and Geburt der Pferde (1913) amid colleagues at the College Art Association conference in New York City. The very next day I learned “Raubkunst at the Ringling” had been formally recognised as a “solved” case of Nazi looted art with the recognition of my findings by the Commission for Looted Art in Europe in the annals of The Central Registry of Information on Looted Cultural Property 1933-1945. My hope all along has been that the John and Mable Ringling Museum of Art, the State Art Museum of Florida operated by Florida State University, would acknowledge the illicit acquisition of the prints by the American UPI reporter Robert Beattie from the notorious “Kunsthändler to the Third Reich” Bernhard A. Böhmer in 1940, prior to Beattie’s donation of them to the Ringling in 1956, where they have been hidden since, and allow these works to be shared with the public. But wait: I have subsequently learned that there is potentially even more Raubkunst at the Ringling: Paintings by Christian Rohlfs and George Grosz and bronzes by Ernst Barlach with provenance gaps from 1933-1945 are also locked away at the museum as well as some oils and terracottas from the 16thand 17thcenturies that, while not entartete, were simply stolen or subject to forced “sales” from museums or private owners under the Reich. To more fully bring this story to light, I would like to compile a volume – half catalogue, half detective story – about these works. Please do contact me if you are interested in working together on this project. The only social media I participate in; this feed is mostly about art history and animals. In this sidebar to “Raubkunst at the Ringling,” which has appeared in this week’s in Lapsus Lima, I compare the fate of Geburt der Pferde and Schöpfungsgeschichte II, whose whereabouts are known, with the case of Marc’s famous 1913 painting Turm der blauen Pferde, which remains missing. Despite the circus that has sprung up around its memory, Turm der blauen Pferde, as a physical object, is absent. While these case studies are of interest in and of themselves, I hope also to raise questions about the ethical conduct on the parts of some museums, which, as public institutions, have an obligation – perhaps now more than ever – to stimulate, educate, and provide access and information to the patrons they ostensibly serve. Turm der blauen Pferde has also given me, in a roundabout way, inspiration for my next line of inquiry, which takes me at last back to animal studies. I am very grateful for the support of Mónica Belevan of Lapsus Lima publishing imprint and HAUT Architectural Solutions for keeping me focused on this project and to many others who know who they are. This project began in the summer of 2016 and got a push from the Raubkunst al Erinnerungsort workshop that winter sponsored by the Zentrum für Historische Forschung Berlin der Polnischen Akademie der Wissenschaften; the Zentrum’s own scholars were then immediatley relieved of their positions for not preemptively falling in line with Poland’s implementation of the law forbidding citizens to accuse the Poles of Holocaust-related crimes. And things are worse now. In the summer of 2017, a jointly-sponsored exhibition titled Vermisst: Der Turm der blauen Pferde von Franz Marc: Zeitgenössische Künstler auf der Suche nach einem verschollenen Meisterwerk (Missing: The Tower of Blue Horses: Contemporary Artists in Search of a Lost Masterpiece) opened at both the Pinakothek der Moderne in Munich and the Haus am Waldsee in Berlin. The parallel shows feature works themed around Franz Marc’s 1913 totem of Modernism. Naturally as a Marc researcher nothing delighted me more than seeing artists of our own time so moved to create by Marc’s work. But it also seems to me that by making a crime committed by the Nazis into a social media event – the Pinakothek exhorted visitors to the exhibit to “keep the mystery of this icon of painting alive”[i]– German museum culture once again obfuscated reality. In fact the only “mystery” is that the whereabouts of the famous stolen painting are unknown, and the museums who profit from celebrating the work of the Blaue Reiter have done very little to abet Turm der blauen Pferde’s recovery. Perhaps because of this intent to diffuse, the thematic homages to monumental painting were ranged from tepid to terrible (the notable exception being Marcel van Eeden’s High Mountains, a Rainbow, the Moon and Stars). In fact over the years, many opportunities to learn more about the Turm’s fate have gone unmet. In early 2001, Jan A. Ahlers, the Herford textile magnate and well-known collector of Expressionist art, received an intriguing offer. An anonymous “seller,” his or her identity nonetheless verified by an intermediary at a bank in Zurich, wanted Ahlers to quietly purchase and repatriate Marc’s Turm der blauen Pferde. The canvas, according to this account, had been hidden by then for more than 50 years in a bank vault in Switzerland. Instead of accepting a meeting, Ahlers approached the then recently-opened Franz Marc Museum in Kochel and the Westfalian state authorities. To Ahlers’s surprise, nothing happened, and, frustrated, he ended up telling his story to the Berliner Zeitung and Artmagazine. [ii]Ahlers died in 2013, having never been interviewed by German federal or state investigators. The seller or sellers, and with them the painting, disappeared once more. Yet the earth continues to give up its Nazi secrets, sometimes literally, as in 2010 when excavators in Berlin surveying property around the new Reichstag found Emy Roeder’s 1919 die Schwangere, missing since 1937, dangling from the prongs of a backhoe. It was both thrilling and horrifying to learn in November 2013 that Marc’s missing 1911 canvas Pferde in Landschaft had also been hiding since the 1940s, this time quietly in the Schwabing apartment of Cornelius Gurlitt. Saddening was the fact that many, many people – amid them museum staffers, Bavarian state police, and German federal agents – had been aware of what became known as the “Gurlitt Hoard” for years, and cooperated with the police in not revealing its somewhat accidental seizure – the elderly son of another art-dealer-to-the-Nazis, Hildebrand Gurlitt, was actually nabbed for behaving suspiciously on a train from Zürich to Munich, and was found to be carrying more thn €100,000 in his pockets. [iii] Naturally the curators of the Städtische Galerie im Lenbachhaus und Kunstbau München – the repository of the world’s largest collection of the art of the Blaue Reiter – were called upon to authenticate the Marc painting as well as works by Wassily Kandinsky and August Macke. Annegret Hoberg, for more than 25 years the Blaue Reitercurator at the Lenbachhaus and the acknowledged expert on Marc’s professional career, had been in on this omission of silence. Hoberg has devoted her life’s work to the Blaue Reiter. Yet she did not love it enough to shout joyfully from the rooftops of the Gurlitt discovery, or think enough of the citizens of Munich (whom I assure you are as enthusiastic fans of the single native Bavarian Blue Rider as they are the Bayern München football club) whose taxes and donations pay for the city gallery to break the silence. I believe Turm der blauen Pferde probably exists somewhere in the world – though since I began this quest I have changed my position on what a hopeful outcome to its loss would entail. But questions related to provenance research seem to begin, not end, with the discovery of missing and stolen artwork from the entartete Kunst catalogue. The story about Turm der blauen Pferde, which, while likely true has now grown so distant as to become apocryphal, made me curious about the psychological resistance, particularly in museum and legal cultures both in Germany and the United States, to dealing directly even with confirmed cases of located “missing” artwork, such as in the case outlined in my story Raubkunst at the Ringling. Marc’s missing painting is paradoxically one of the most recognizable art objects in the world, reproduced after World War II ad infinitum on postcards, postage stamps, T-shirts, coffee mugs, and keychains. Marc was an emblem for Germany’s reclamation of the historical avant-garde, and, yet, as a daring and heroic cavalry officer awarded the Iron Cross before being killed at Verdun in 1916, he was indisputably a patriot. Reified through replication, the shock of Marc’s crystalline colors and embodied animals was displaced and diminished. Turm der blauen Pferdeis a cipher, an eternally reproduced copy without an original. Turm der Blauen Pferde is two images, one the 2 by 1.3 metres painting missing since 1949, when it was last seen in Berlin’s Haus am Waldsee, the other 14 by 9 centimetres postcard in the Bayerische Staatsgemäldesammlungen in Munich.The images are not identical but they do show the same group of four horses, and we can reconstruct their identities from knowing more about what Marc had been reading and looking at before he made these two paintings. The artist’s most famous [work] captures us in its spell. (…) We are drawn to the image even as we are forced to keep at a respectful distance. The group of four horses glows like a vision in front of us. Moved just to the right of the central axis, the outline of the narrow portrait fills the canvas almost entirely revealing to the side just a glimpse of an equally mysterious landscape. This is valuable information, because Lankheit had the opportunity to closely study the painting that has been seen by very few people living today. Lankheit’s passage eschews a lengthier description of the celestial markings adorning the animals, which are one of the chief differences between the postcard and the painting. Lankheit observes also how the “clear-cut crescent of the moon” is in contrast on the chest of the darkest of the four horses, acknowledging the individuation of the animals. [v ]There is a solar aspect to both the painting and the postcard, and we can infer that Marc is making both a reference to and a statement about animals representing the Helios horses for the new age. In Marc’s vision the horses are unrestrained by a charioteer. They are ennobled not by the gods and goddesses but by their union with the Earth and the constellations. The horses in the painting inhabit a more vibrantly colored landscape (owing possibly to the deterioration of the postcard, or the enhancements to the digital images and photographs we have of the painting we have at hand to consider), have less distinct outlines, and fewer astronomical markings. Nevertheless, the open-topped, heraldic crescent has been retained on the chest of the front horse. My point in relating these details is that as a real object with an actual history of its own, and a post-life as Raubkunst, is that Turm der blauen Pferde deserves, on the one hand, as a painting, to be the subject of continued study and interpretation. As art historians we know that this practice is really what keeps a work of art alive in the minds and eyes of spectators. As a victim itself of looting, the painting’s fate deserves to be known. The German museums devoting so many resources to celebrating its disappearance would do well to take a hard look at the circumstances of its vanishing, and uncovering its likely whereabouts. [ii]Joachim Nawrocki, “Ersitzen oder Besitzen?” Die Welt, 25 May 2001. [iv]Das berühmteste Bild des Künstlers (…) schlägt uns in ihren Bann. Wir werden mit Macht an das Bild herangetrieben, schon im selben Augenblick aber zu achtungsvoller Distanz gezwungen. Wie eine Vision leuchtet dicht vor uns eine Gruppe von vier Pferden auf. Aus der Mittelachse nach rechts gerückt, füllt ihr Umriß das schmale Hochformat fast ganz aus, nur seitlich den Blick auf eine ebenso geheimnisvolle Landschaft freigebend. Der mächtige Körper des vorderen Tieres mißt nur wenig unter Lebensgröße. Das Pferd scheint aus der Tiefe nach vorn zu drängen und unmittelbar vor dem Beschauer zu verhalten, indem es den Kopf in edlem Schwung zur Seite wirft. Seine Stellung im Raum läßt sich nicht errechnen, denn der untere Bildrand überschneidet die Beine (…).” Klaus Lankheit. Franz Marc: Sein Leben und seine Kunst. (Köln: Dumont), 120. My translation. [v]In a volume Marc had in his own library – he discusses it as early as 1899 – Plato tells us that the four Helios horses had distinct attributes and personalities. The first (the horse in the front of the painting) is characterized by immense beauty, size, and speed. Though Marc shows the sun and moon glowing within this animal, he also has an individuated, recognizable blaze painted on the team leader’s face. The second horse, named after Hera, steers the chariot; the third “dark horse” upon whom the sun nonetheless shines is called Poseidon (slower than the second); and the fourth, stiffly relegated to the back, takes her name from Hestia: “The horses are peaceful and friendly and one does nothing without the others.” Plato and John Alexander Stewart, The Myths of Plato Translated with Introductory and Other Observations, (London: Macmillan, 1905), 173. [vi]“Deine glückseligen, blauen Pferde sind lauter wiehernde Erzengel und galoppieren alle ins Paradies hinein.” Franz Marc and Else Lasker-Schüler, Der Blaue Reiter präsentiert Eurer Hoheit sein Blaues Pferd: Karten und Briefe, (Prestel: München, 1988), 144. My translation. See also: Betty Falkenberg, Else Lasker-Schüler: A Life, (McFarland: Jefferson, N.C.: 2003), 86. I was very happy to have the grant renewed and be invited back to the SouthShore Regional Public Library for another series of “Art History at the Library” discussions. The library had in mind a series that was a little more intensive than “art appreciation”-cruise ship type talks. I did try out some kind of conceptual themes last time, but I also was able to implement my tech whirligigs and to do something I had wanted to do for a long time, have the audience be able to drive a lot of the content. I experimented with this just by stopping often to ask if people had questions or comments, and to my delight they did. I try to memorise what I’m going to talk about so it’s possible to both extemporise as desired by the patrons’ concerns and also not get thrown off track. Anyway the schedule for the fall is below. Thank you again to the Hillsborough Public Library Cooperative for supporting this project. 15 September: “Special Guest Appearances: Art in Movies and on Television.” Participants are invited to think of their own favorite examples to discuss and share. This talk will examine the appearance of artworks and references to famous works of art in popular movies and television programs, including Vikings, Bojack Horseman, The Young Pope, Skyfall, and more. We’ll also discuss films that are about artists and art. 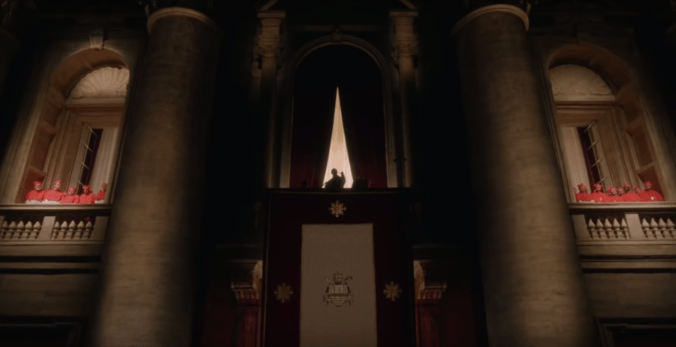 I am especially excited to be able to talk about some of the painterly images from The Young Pope, which so centre the body. 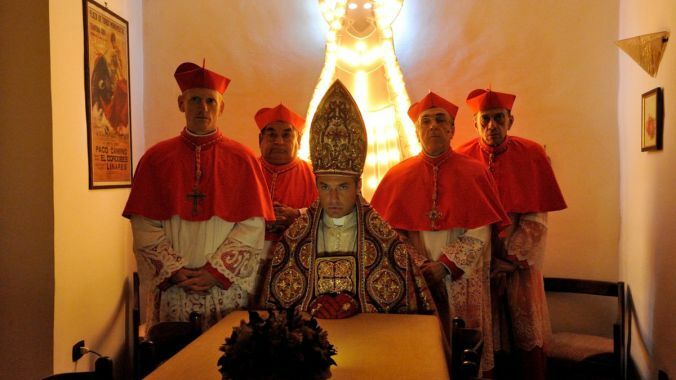 I know a lot of people hated this show, but I liked how it looked, and found director Paolo Sorrentino and cinematographer Luca Bigazzi neomodernist visual world were stunning but also very ambiguous about the questions of faith and the supernatural raised by the narrative. 20 October: “The Body in the Book: Beauty and Suffering in Illuminated Manuscripts.”The session will be about the process of making illuminated manuscripts and scrolls including well-known examples such as the Book of Kells and the Grimani Breviary as well as less-familiar secular texts. 17 November: “What’s the Difference Between Arts and Crafts? Fashion, Textiles, and Design.” Rather than trying to come up with a definitive answer to this question, we will discuss how aesthetic hierarchies come to be. Which tdo we prize more, purely aesthetic innovation, of the form of utilitarian objects, and why? Participants are invited to share examples of their own works and of course their opinions! 15 December: “A Celebration of Animals in Art.” This discussion will cover artwork that recognizes the power of animal life, from the cave paintings of Chauvet and Alta to Tanja Thorjussen’s endangered Arctic wildlife and everything in between. 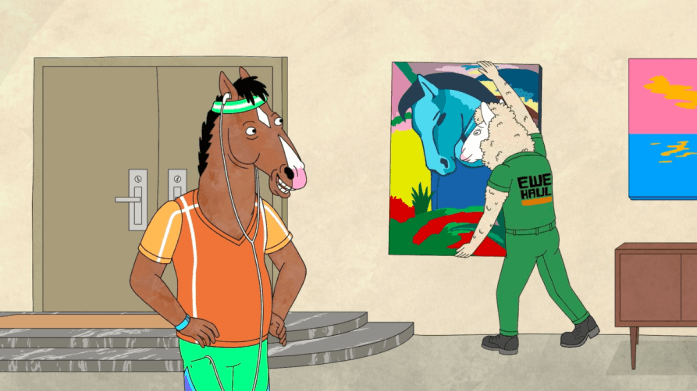 Franz Marc’s Blaues Pferd I (1911) in Bojack Horseman, above, and shots from The Young Pope (2016) below. Michelangelost™ is the newest name for the blog I have been writing since 2006, which began as mostly about dogs and animals. It has since had several titles, including Errata and German Modernism, and expanded to include numerous topics. Even though this website is becoming more of an official enterprise, I have kept my experimental and sometimes idiotic posts in the archive. The name Michelangelost™ came to me in Berlin, where Michelangelostraße is one of the stops on the Tiergarten Buslinie 200. Because the name of the stop is so long it was (funnily to me) abbreviated as “Michelangelost” on the scrolling Haltestelle legend. A remarkable photo was taken to document this occasion. I love obscurantist plays on words plus it seems descriptive of where we are in the art world right now. 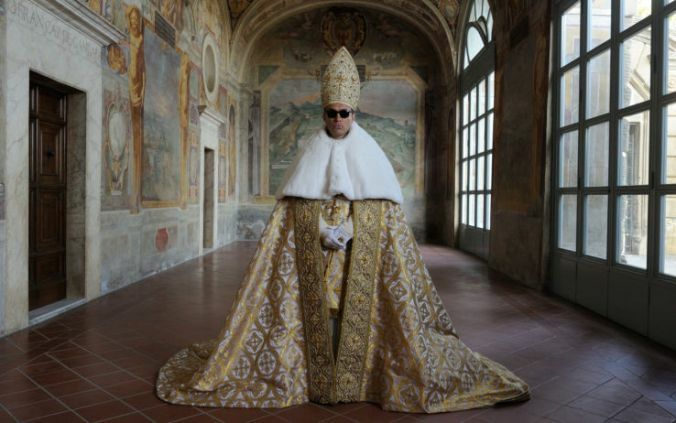 I had intended the Michelangelost™ project to be devoted to art criticism in the broadest sense, extended beyond galleries and museums to organisations, scenes, and academic affiliates, but I like the word and this photo in a more general way. So you will have to stay tuned for that secondary project, which now tentatively has the name “Intersectional Criminal Tribunal.” Meanwhile I am experimenting with this new design and how to retroactively typeset the older posts. – Until soon. 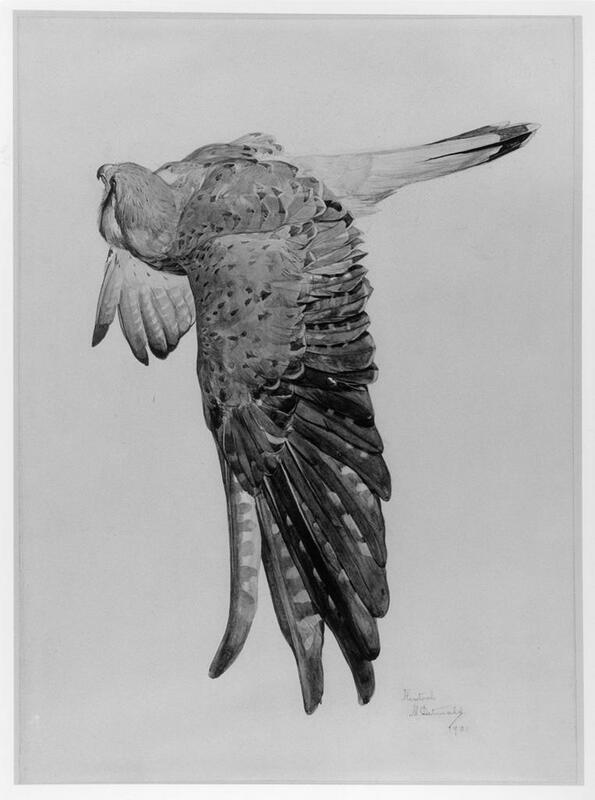 Charles Maurice Detmold (1883-1908), Kestrel in flight, 1901. Watercolour. British Museum. Dept. of Prints and Drawings. We, as mere humans, cannot see and feel as birds do as they navigate their habitats. Birds have immediate needs that relate directly to food availability, energy, water, and temperature, social contact, reproduction, predator detection, and shelter that are more complex than the features we perceive on their behalf as “nature.” Nevertheless, it is urgent for us to understand what bird species need from their surroundings as human intrusion, habitat loss, and climate change conspire to accelerate our need to make the best use of those habitats we can manage for the remaining populations of birds who survive. This is part of what makes Birds: The Art of Ornithology by Jonathan Elphick such a vital contribution to our historical knowledge. A recent zoological conference in London featured a game of “Animal Studies Tic-Tac-Toe,” in which “David Attenborough” occupied a central square. Though the game was in jest, it is certainly true – and tellingly so that this is often the case even for those whose profession ostensibly involves the fauna of the wilderness – that for most people, the experience of nature is mediated by films such as those in the Life and Planet Earth series, augmented by precision editing, emotional cue music, and witty commentary. Though not the overt intention of Birds: The Art of Ornithology, this book is a powerful reminder that connecting meaningfully with nature requires leaving the house, and that this experience is both transcendent and daunting. Birdwatching especially demands patience, silence, and solitude. Elphick conveys this foregrounding with subtlety, and describes the conditions faced by naturalists in the time before photography and video, who, tasked often only by their own passion – what John James Audubon characterized as “…nothing was left to me but my humble talents” – set out not only to observe birds but to record their activities and document their environments.